Fall cleanup includes leaf collection and removal. Fall cleanup is vital to your lawn’s survival. 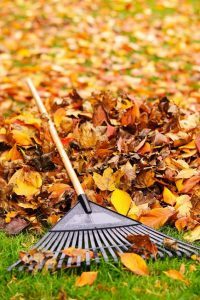 Leaves cannot be left to remain on the lawn over the winter to decompose as they are acidic, causing the soil pH to become acidic and a detriment to your grass. This process occurs because lawns are alkaline-loving and are sensitive to a sudden acidic increase.